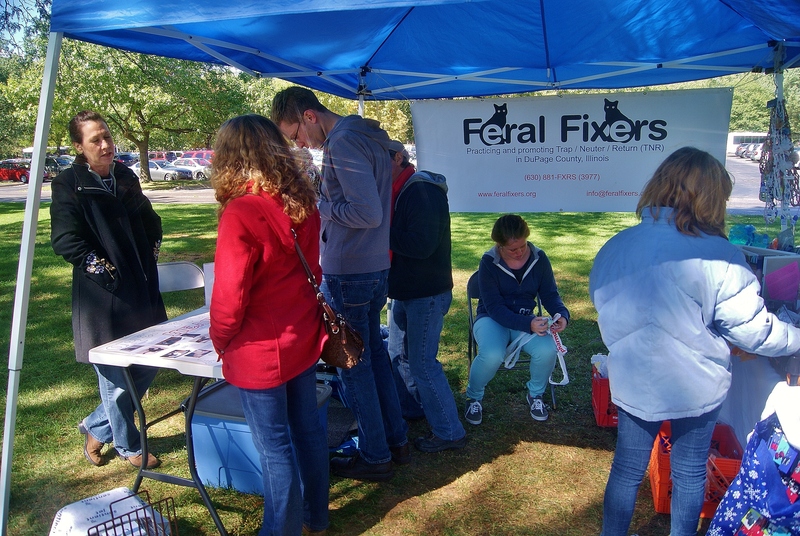 Last weekend, Feral Fixers hosted a booth at the Cantigny Park Green Fest - our first time at this event. We were very pleased to have Recycled2New share our booth with us. Thank you Laura and Megan for braving the frigid cold outdoors to support our great cause the entire day! And thanks to Laura and her handy clips and shower curtain hooks, we were able to leave the event with our tent intact. Other vendors weren’t so lucky in the gale force winds… Laura and Megan did a wonderful job!! Shout outs to Dawn and Sue for attending at their allotted times. It was nice to see and speak with them to round out our afternoon. And thank you Sue for transporting everything back to Tammy’s house for me. That was especially nice of you. We collected many generous donations, and passed out a bunch of business cards. Hopefully this will generate additional calls to Tammy. The attendance was light (per a attendee last year), due to the cold and blustery weather. But I do believe people were interested and very supportive of what we are doing. After about an hour in, we had steady attendance at our booth. I think if the weather would have been warmer, and less windy, a lot more people would have been out and about. If we do this again next year, I would suggest a booth position as close to the middle as possible, or closer to the stage. That seemed to be where the most people congregated. Our booth was located closer to the end, and not sure timing of signing up had anything to do with booth position? Thank you all for your assistance, attendance, and excellent representation for Feral Fixers. Thank you Kurt. The picture thumbnail is of our booth, of course, and by clicking on it you can see a full-size version of the photo.